Is Groupe SFPI Safe For Investors? Groupe SFPI is a French small-cap industrial company. The strong balance sheet makes the downside limited. Profitable operations and solid prospects are reasons for upside. Groupe SFPI is a French small-cap industrial company, well-managed and with a strong balance sheet and good prospects. Its shares have dropped 35% in the last year for no apparent reason other than the market correction at the end of 2018. SFPI Group (“Safety for People and Industry”) was created in France in 1985 by entrepreneurs led by Henri Morel, who wanted to engage in the area of specialized industry safety solutions for people, goods and the environment. In 2017, SFPI Group generated a turnover of more than €504.5 million in the safety industry. 38% of revenues are generated outside of France. SFPI Group has 3,820 employees, 40% of whom are based outside of France. The company operates 4 businesses under 2 units. Construction is the security and safety for buildings unit. €364 million in sales (72% of group revenues). It includes MAC (Windows, blinds, awnings, shutters, garage doors for residential and non-residential buildings) and DOM security (locking and access control equipment and systems). Industry is the air treatment and energy control unit. €141 million (28% of group revenues). It includes MMD (heat exchanger and sterilization equipment and systems) and NEU-JKF (air treatment solutions for the industry). These businesses have large installed bases, where aftermarket revenues are relevant and very profitable. Acquisitions are essential to keep building a solid market position in the construction and renovation sectors. SFPI has made several acquisitions over the years, and in 2018, completed the acquisition of the 30% it didn’t own of DOM Security. In the last few years, the company bet significantly on its internationalization, new product development and on its digitalization strategy. That has materialized in R&D investments (4.5% of payroll expenses) and in an increased production capacity (+37 million in the last 3 years) that have contributed to reinforce organic growth. Its shareholder equity is €188.80 million. In the last 3 years, SFPI has generated an average of €28.8 million in earnings and has paid an average of €3 million in dividends (10.4% payout ratio). The free cash flow average was €15.65 million, lower than earnings due to the purchase of investments in the period. Henri Morel is the founder of the group. 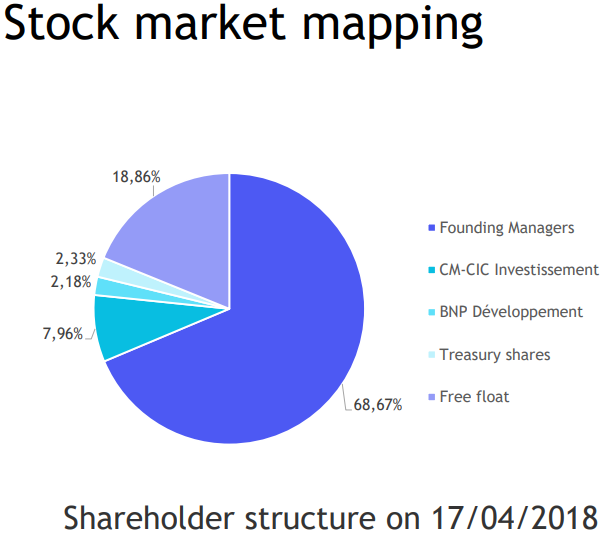 The French entrepreneur has created and developed several businesses, and consolidated them in the holding company SFPI. He controls 67.7% of SFPI shares. Groupe SFPI presented its sales performance for 2018 last February. Total sales grew 9%, with all units contributing positively to it. Organic growth (excluding acquisitions and divestitures) was 3%. The company continues presenting solid numbers, meaning its prospects are intact. For a business with consistent operating conditions, strong balance sheet and stable management, a P/E multiple of 12 is well-deserved. The company has traded between €2.90 and €3.30 (€281 million and €321 million in market cap) since 2016 until September 2018. That meant an average P/E of 12x, or 14x excluding cash. In October, it broke down to €2 per share without any relevant news other than the conclusion of its DOM Security acquisition. Note also that other big competitors like Assa Abloy (OTCPK:ASAZF) or Allegion (ALLE) trade on average at a P/E of 20x+. The economic conditions in France and internationally. The company’s use of its huge cash reserves. Criteria for acquisitions will continue to be a key component of success.